When planning our first Friendsgiving last year, either there weren't as many Friendsgiving guides available as I've seen this year, or I just didn't read them. Most of what I've seen recently describes this now-trending faux holiday as a very relaxed, informal affair. Whoops. I see it as: fancy dinner party plus best friends & comfort food minus typical family stress equals a celebration everyone actually enjoys. 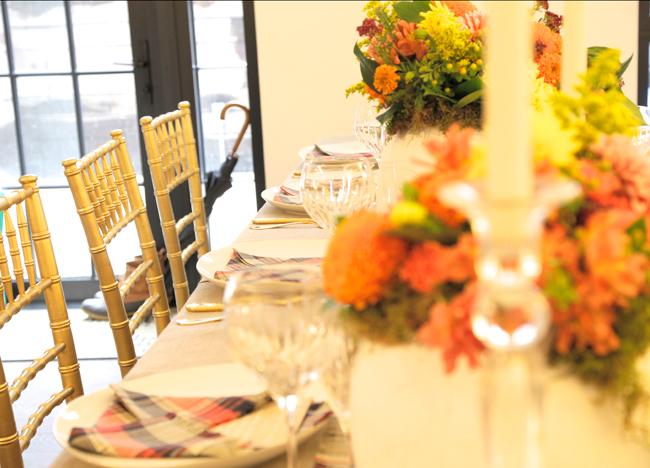 And a fantastic excuse to use our wedding crystal! Mismatched chairs and paper napkins weren't exactly on my radar. 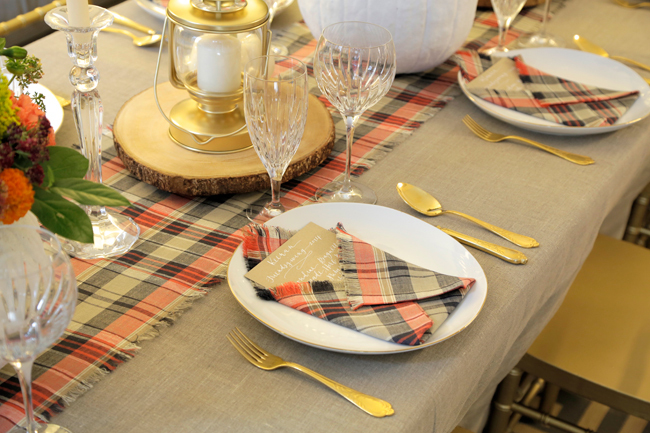 I did keep the look semi-rustic with the natural linen tablecloth and the plaid linen runner and napkins - I love how those look mixed with the crystal glasses and my grandma's gold flatware. 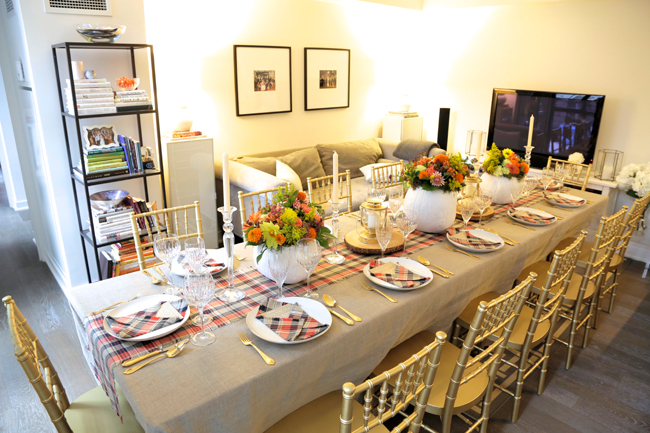 As you can see, we had to set up the dinner in our living room. Our original plan was to dine on the terrace, but it was cold and rainy. Not even last minute patio heaters could solve the rain problem. Moving our coffee and dining tables to the basement storage room for one night wasn't ideal, but overall we made it work and it was worthwhile. And setting up our bedroom for cocktail hour was actually really fun! I love the life added to this shot by the umbrella and L.L. Bean boots in the background. Speaking of - a huge thank you to Darren Gantt Photography for stopping by at the last minute to capture these beautiful photos. The rain made the room terribly dark and Darren is so talented for being able to work his magic given the conditions. I think he might actually be some sort of wizard. 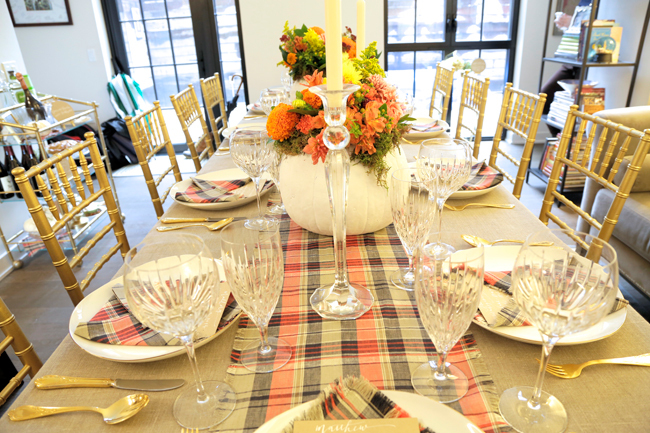 PS: If you missed it, here is last year's Friendsgiving tablescape. 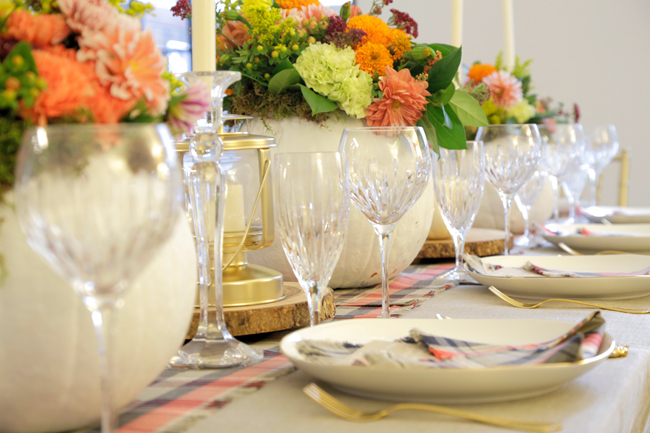 You can see that a lot of the elements are the same (dinner plates, glassware, flatware, candlesticks) but by choosing a few new items (linens, centerpieces, menu place cards) a whole new look can be achieved without starting completely from scratch. 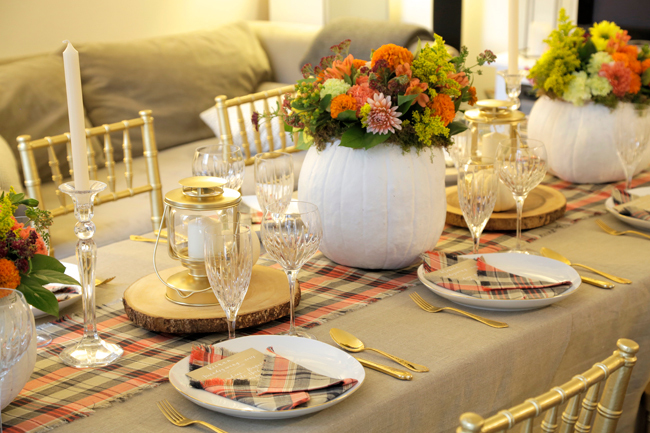 If any of you threw a Friendsgiving celebration last weeked, or are planning to soon, I'd love to see photos! !